I was sitting sooo long on this ahaha .. But I really like how it came out! Great job! You know what crossover I wouldn't mind seeing? What do the Wing Dings say? Just give Sans a shirt. I love this, and I love the Echo amv! ^^ Awesome! Not sure if this was allowed by you but just in case: This site is selling your poster, without your signature. So just in case I thought i'd let you know. Also, I extreeemmeely love this picture great job!! You can feel the power in Sans and the support of Papyrus! Hey, thanks for telling me ! But thank you for looking out ! Yeah np. As a fellow artist myself ik id hate to see people using my art without ask and changing it >: (. idk why people have the nerve or guts to do this...It gitters and shakes me when I think someone took my art. Just the risks of posting art online... ;-; watermarks sometimes help but then it obscures art..
Yea that's a risk we gotta take :T ..
V0idless i wish you had comics! :3 The way you draw is so cool! Though I wanted to start working on an original animated series ^^! I am curious about something. 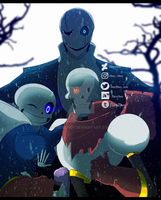 Why does your version of Gaster fight Sans for? Also could you try giving drawing lessons? on drawing Undertale characters sometime? Me and my Nieces wanted to ask you if you could create a Gaster Shimeji. I'm working on a Undertale Comic Prequel. I have for awhile now. How long have you been Drawing and Creating Animations? But I wish you good luck and lots of fun with it! Hey, i got a question. Is your version of Gaster good or evil? Gaster from your Echo and Re:incarnation music videos! Question thats been nagging me forever: What Are gasters plan? Hes after sansy, Yes, but Why does he want sans?! Hmm it's an internal kind of struggle, where both are fighting over control. Sans doesn't want to face Gaster, so he's running away most the time or falling unconcious nearly losing himself. But when he's thinking about his friends and getting fueled with their souls and determination, especially papyrus, helps him to stand up and try to fight. In the end he didn't win for 100% 'cuz he's still feeling Gaster's presence inside of him, like, you can try to forget about something, but in the end you can never really forget, it's always there, burried somewhere in the depths of your mind. They were fighting for control over what? Why was Gaster after Sans? Your animation skills is amazing! I'm new here but i have watched your ECHO video. The only thing that came to my mind other than "THIS IS AWESOME" was "Why is gaster after sansy??" Mind Sharing a little spoilers, please????????? O_O its- its- ITS-! AWESOME! D: I know what my next laptop background is going to be! Well, I actually work in the seoul comicons in Korea, which opens each month- except july and september, this year. ^^ I'd love to go and see your con, but I can't. If you want, I can get you a free entry of the comicons, if you can come, that is. I wish I might get to meet you in real life. I'm a freakin fan of yours!!!!!! (squee) Anyways, please reply back to let me know. Aw thanks for the offer !! Wish I could meet you- I mean, seriously! I love your art it is just so amazing! for Undertale is so amazing! I can't wait until Re:Incarnation gets released! Happy you both like it x3!!! v0idless, i was wondering if you could look at my profile. all fans will like a lot. Along with a unique ship to it. fans glued to their seats! I am practicing like crazy on Undertale. Oh i wish you lots of luck and fun with the comic owo!! Making a comic is really hard haha so I hope you can keep it up x3!!!! And keep on practicing! I also still do ! Your Re:Incarnation teaser has got me hyped all over again! Can't wait! "I'm rooting for you, kid!" ...Is Sans holding a freaking SAVE point? I can hardly wait to see what the story behind that is.